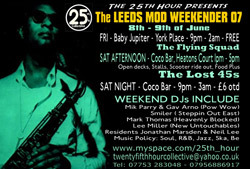 Details of this year’s Leeds Mod Weekender are now on the site. Taking place over the weekend of the 8th and 9th June, with a DJ line-up featuring the likes of Mike and Gav (Pow Wow), Lee Miller, Smiler and Mark Thomas. And there’s live music from the Flying Squad and Lost 45s. For full details of the event and to view a large-sized flyer, check out the events listing. Hi! here’s Alberto from Milano/ Barcelona. I am desperately trying to get in touch with Lee Miller. Lee, if you read this message, please contact me asap. Thanks!! !